Hard water is common in many regions, and can be a nuisance. It can cause unsightly mineral buildup, poor soap lathering, and in some cases can even damage appliances and plumbing! If your home has hard water, you may be interested in how to fix the problem. 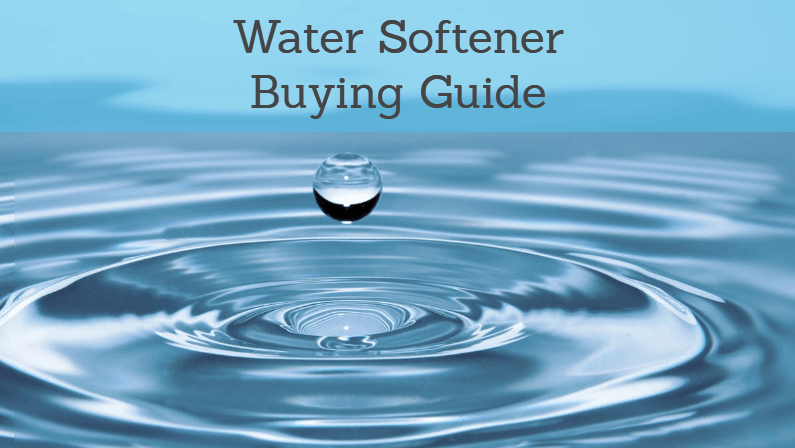 The guide below will help you find the best water softener for your needs and budget! The Fleck 5600SXT is somewhat of a gold standard in the industry. In fact, the electronic valve on this unit is used on many other water softeners, even flagship models from competing brands! The 5600SXT is reliable, well made and capable of handling large volumes – it can comfortably handle households of up to 6 people. It can maintain a flow rate of up to 12 gallons per minute. The high grain capacity means that this unit can soften even the hardest water sources. The digital valve keeps things running smoothly, while the automatic meter-based regeneration cycle continually flushes the filtering resin with minimal effort from you. In short, this is a low-maintenance, high-performance unit. Fleck water softeners are some of the most respected in the industry, and are commonly recommended by plumbing and water treatment professionals. The 5600SXT is also very well rated in water softener reviews (find our full review here). It consistently tops recommendation lists from industry experts, and we agree! Click here to learn more about the Fleck 5600SXT. The Watts RV PRO-1000 is a great portable water softener that’s also our top budget-friendly recommendation. It costs much less than many of our recommendations, but still does a good job at softening water from moderately hard sources. Keep in mind that this unit is designed for RVs and small living spaces – it won’t keep up with the needs of a large family. It has a max 4 gallon per minute flow rate, 10,000 grain capacity and 1/3 cubic feet of resin. The unit earns good ratings in water softeners reviews, and is a great choice for smaller living spaces. The Fleck Iron Pro 2 is the best water softener for well water. It has a massive 64,000 grain capacity, and is designed to handle even the hardest water sources. It is also effective at filtering out iron, manganese, rust and sediment without getting clogged up. For well sources, these features are very important. The Iron Pro 2 is on the pricey side, but it’s a high-end, highly effective water softener. It can handle a flow rate of up to 16 gallons per minute, so it can easily handle large homes with lots of water usage. The unit is backed by a 10-year warranty on the tank and a 5-year warranty on the digital valve. 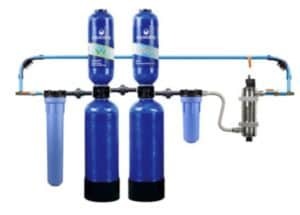 For well water, this is likely the best water softener system out there. Click here to learn more. The Aquasana EQ is an innovative whole-house unit that combined a water softener with an advanced water filter. 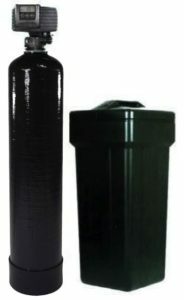 It’s the best water softener on the market for those looking for an effective way to treat all the water in their house. Not only does it soften water sources, it also removes chlorine, heavy metals and other contaminants. The softener used in this technology is salt-free, which is designed to reduce scale and protect your appliances. There’s even an optional UV light filter that helps kill viruses and bacteria that may pass through the water filter! If you’re looking for a whole house water softener that also filters drinking water, this is a great choice as confirmed by countless Aquasana reviews from satisfied customers. Hard water is water that is high in dissolved minerals such as magnesium and calcium. It generally does not pose a health risk, but can cause various issues and annoyances with household tasks. Mineral sediment buildup on shower walls, sinks, faucets, etc. These are some of the issues hard water can cause. Using a good water softener can help reverse these problems. This can result in softer water, which will clean clothes and dishes better (while using less soap), and won’t leave that icky sediment everywhere! Water softeners work by running your water through a chamber full of resin beads. These beads attract the hard minerals, such as calcium and magnesium, that are contributing to your hard water problem. The water runs through these beads before it reaches your tap or shower. Eventually, mineral buildup on the beads needs to be removed. This is when your system needs regeneration. The process of regeneration involves the resin beads passing through the brine tank (filled with salt) to reduce mineral buildup. On newer water softeners, this process is automatic, and controlled by a digital valve. Softening Technology: Our main consideration was the type of water softening technology used in each unit. Most units use a salt-and-resin setup, although there are also some salt-free versions. We picked models that use advanced filtration technology, and require minimal effort to operate. Water Flow/Capacity: The capacity and maximum water flow of each unit was another important consideration. We picked models that could handle reasonable water pressure and supply softened water to midsize to large homes. Reviews: We also looked at third-party water softener reviews. This gave us lots of useful data to add to our own findings. It also allowed us to evaluate how effective each unit was in a variety of areas, with a range of water hardness levels. Build Quality: We looked at manufacturer specifications and third-party reviews to get a sense of the build quality and durability of each water softener. These units are not cheap, so we wanted to ensure our recommendations would last a long time!